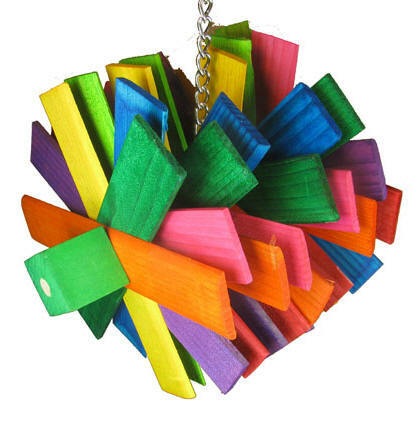 The Turbine features 32 pieces of colorful, chewable, 8" wood hung on a nickel plated chain and topped with a quick link for easy hanging. Everything is chewable on this toy (except the chain) since the slats are held together with wooden dowels. Our parrots loved snapping the skinny slants and turning the Turbine into toothpicks. Great for those larger, active Busy Beaks (chewers) in your house!